Rome Braves pitcher Nolan Kingham has thrown 16 innings and allowed one earned run in three starts so far and compiled an ERA of 0.56. Rome completes its first homestand of the season today at 1 p.m. against the Columbia Fireflies. 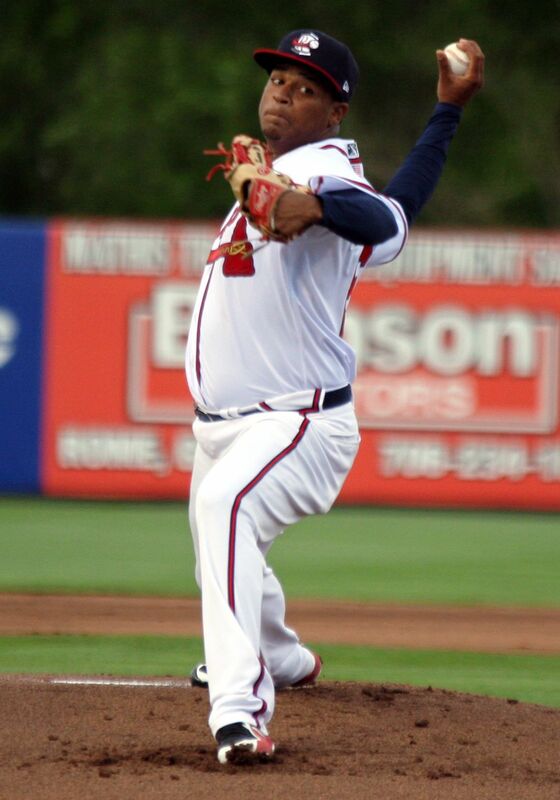 Jasseel De La Cruz allowed one run on three hits and struck out six in his start for the Rome Braves on Wednesday. Coming into today’s game, the Class A team has gone 4-2 at State Mutual Stadium since pulling out a 4-3 win in the bottom of the 10th last week against Greenville and has had players step up at the plate and on the mound to give the group some lift early in the year. Rome evened its three-game series against the Columbia Fireflies at one game apiece on Tuesday following an 8-1 victory that wasn’t as lopsided as the final score. Entering the bottom of the eighth, Rome and Columbia were locked in a fierce pitcher’s duel and tied 1-1. The Braves then scored seven runs and sent 13 hitters to the plate, beginning with Carlos Paraguate’s double off the center field wall. Andrew Moritz brought him home with a single to provide the eventual winning run. Greg Cullen added an RBI single and Griffin Benson provided the big blow with a two-run double to make it 6-1. Rome scored its final two runs on a Braulio Vasquez single and a Paraguate sacrifice fly. Rome starting pitcher Jasseel De La Cruz completed five innings, allowing one run on three hits. He struck out six and walked two. Jose Montilla was rewarded with the win for throwing three shutout innings in relief. Columbia took the series opener Monday 3-2 with a solo home run in the top of the ninth. Still, Rome starting pitcher Nolan Kingham had a second quality outing, throwing a season-high six innings and allowing only one run, which was unearned. He struck out one and issued no walks. In three starts so far this season Kingham has thrown 16 innings and allowed one earned run. His current ERA is 0.56. The series finale between Rome and Columbia is today at 1 p.m. at State Mutual Stadium. Rome will start Jose Olague and Columbia will put Jaison Vilera on the bump. Sunday saw the Braves use a six-run fifth inning to erase a four-run Greenville lead and take the series from the Drive with an 8-7 win. The first seven Rome batters reached base in the fifth thanks to four hits, three walks and an error. Tied at 5-5, Moritz provided the game-altering hit, swatting a two-run single into center and giving the Braves their first lead since Friday night. Rome added their final run in the sixth on a squeeze bunt by Jose Bermudez, scoring Trey Harris from third base. Harris had himself quite a series against the Drive as the Cobb County product went 9-13 with two triples, three doubles and two RBI. He’s now hitting .395 for the season to lead the team with 17 hits. Benson is on top in RBIs with eight and home runs with three.